The Supreme Court in the United Kingdom today decided that Alder Hey Children’s Hospital can remove Alfie Evan’s life support without their consent. Alfie’s parents had tried to get the court to withdraw Alfie from the hospital since they are his parents and legal guardians. However the British High Court refused today after a court hearing. Alfie suffers from a rare neurological condition that is destroying his body and the hospital wants to remove Life Support. Tom Evans and Kate James, from Liverpool, lost their case over their 23-month-old son at the Court of Appeal. Judges have also approved a plan for withdrawing treatment and bringing Alfie’s life to an end. 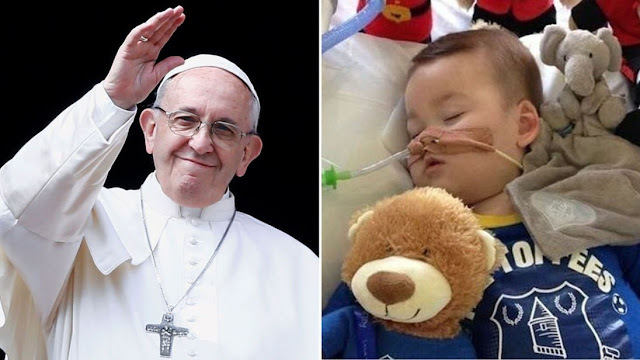 Alfie Evans’ father met with Pope Francis at the Vatican and was told that the Vatican hospital is “ready to take Alfie immediately” and provide the care and treatment. Tom Evans met the Pope and the president of the Bambino Gesú hospital. “The president of Bambino Gesú called me in for a meeting. She wants to take Alfie as soon as tomorrow and will do everything for him,” Evans explained. Please Pray for Alfie and his family.